Look, I’ll be the first to tell you that it takes me a while to write reviews. Kids, work, TV, Kindle, Xbox One – there’s just a lot to do, man. Sometimes I don’t write because I have nothin to say, and let’s be honest, not all candies deserve a review. These Sasso bars though, do. The kind people at Sasso sent us a box of 12, I gave 4 to Jon, and it’s good I had 8 left over because all the females in my house want them, ask for them, look at me like a puppy dog when I open them. Honestly, does it even matter if I like them? You already know my house majority won’t shut up about them. This is right on. The bars aren’t too big nor too small. Also true. It’s not a heavy candy bar. The nougat is more marshmallow-y and softer than what you’d get in a 3 Musketeer bar. Plus the caramel isn’t thick. 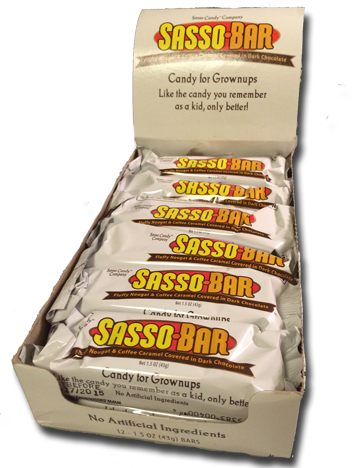 The bars definitely feel “real.” The Sasso web site says they have no artificial ingredients and although the bar doesn’t look like it was made in a homemade kitchen, it tastes like it. Not sure I’d agree on a unique combination though. It’s chocolate, caramel and nougat – isn’t that like every chocolate bar ever made? Very nice. More dark chocolate is a mantra of mine. As fine readers of this ultra fine blog will tell you, I’m the guy who will always pick gummis over chocolate. I know I know, ladies, heresy, but I still know what’s good. I’d order a pizza before getting a burger and fries but I still know that a double double animal style can’t be beat. 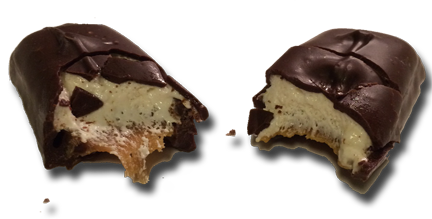 These Sasso small-company-created, right-sized bars of dark chocolate and creamy nougat are like that $15 perfectly cooked burger. Minus the Ketchup. I love that these are made in Oak town, Cali – my backyard – and that this is a small company taking on the big boys. So go – get some of these bars at a local purveyor or on the interwebs. Act local and eat global.